How do you like to relax and chill out? Netflix? Reading a good book and enjoying a cup of tea? Me, I like to fill online shopping carts with items for my dream home. But, the thrill of online shopping can be short-lived if you're shopping US or other international sites from Canada. More often than not, once I add the cost of duties, brokerage fees, taxes, shipping, and exchange rates into my virtual cart, the deals don't seem quite as good. And if the site doesn't even ship to Canada, that's more problematic. However, where there's a shopping will, there's a way! 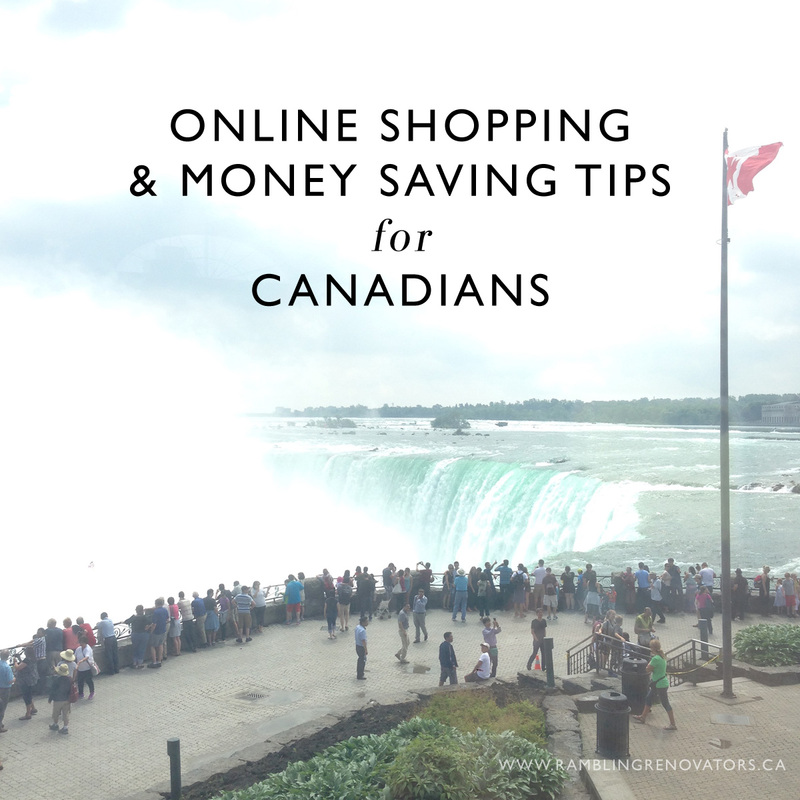 Here's a giant list of my best online shopping tips for Canadians, including how to get products to your doorstep even if the site doesn't ship to Canada and how to price compare using Google image search. Read on! Hudson's Bay - offers an extensive array of product, though their online experience could be better. The product photos and text are too small! Joe Fresh - if you can't find the size you need at your local grocery store, chances are you can find it online. There are some multi-national brands that just get it. You want my hard-earned loonies and toonies? Then make a .ca site that shows prices in Canadian dollars, makes returns easy by mail or in-store, and offers the same products as your US/international sites. Some sites have the duties baked into their pricing while others provide an estimate of duties and give you the option to prepay. It is always my preference to prepay duties when you can. There is nothing worse than getting some fun mail delivered to your home and then a few weeks later receiving an unexpected bill from Fedex or UPS for additional duties that cost 3x the amount you paid for the product. That has happened to me more than once! Banana Republic / Gap / Old Navy - easy returns in store and frequent sales. I almost always put items that I want into the virtual cart and wait for them to go on sale because they usually will in a few days time. Sephora - an excellent online experience. The site is well organized and offers lots of product reviews to read before you buy. If I feel an item will go out of stock quickly before I can physically get to the store (for example, the Bite Beauty holiday lip sets always sell out), I grab them as soon as I see them online and just make an easy return in store or by mail if needed. Walmart Canada - shopping is easy but beware of their shipping options. I once ordered a flat screen TV during their Boxing Day sales and had it delivered to my home. No one was home so they left it at the front door, wedged behind my screen door, no signature required! I'm so lucky it wasn't stolen. Home Depot Canada - offers so much more product online than you find in store. I've been known to spend hours looking through all of their lighting options. Wayfair Canada - From bedsheets to Queen bed frames, I have ordered many home products from this site and love getting large furniture delivered to my door! Again, I rely heavily on the customer reviews before I buy. Purchases over $75 ship for free and duties are included in their pricing. I have not, however, attempted to return anything so I'm unsure on that process. Lands' End - It's not a .ca site but you can shop in Canadian $. Returns are easy too - they provide a pre-paid shipping label and you can drop your return at any Canada Post location. They make long-lasting quality products. Their kids' swimwear is a favourite. eBay Canada - doesn't offer as many products as eBay.com but still a good resource. Etsy Canada - oh man, I can spend a lifetime getting lost in Etsy. Vendors set their own individual shipping policies so you can easily see just how much it will cost to get a product to your doorstep. I've never been assessed duties on an Etsy purchase (and I've bought lots over the last five years!) though I have had to converse with vendors regarding lost or damaged items, and have had to resort to Etsy's case resolution in a few instances. It's all ended well and I love that you are actually supporting an individual maker when you shop on Etsy. Here's a few of my favourite shops. Amazon.ca - if you absolutely can't find what you need, Amazon is the place to look. Just last week I had the most random assortment of goods (a lapel mic, tools for my Cricut machine, a non-slip rug pad, and SSX Tricky, the best video game ever made for our cottage-bound old PlayStation 2) delivered. However, I have also ordered a knock-off bistro chair in the past (more on that below) and had a terrible experience with their return process. Despite having a printable return label, visiting no less than three Canada Post offices, and talking to multiple customer service reps, I discovered there was no actual way to return this large item. I'm not sure if that process has been fixed but its something to be aware of. Now here's where things get tricky. Shopping on a US site means you will be shopping in US dollars (though some have the option of showing pricing in Canadian $), there might be high shipping costs, and likely duties and brokerage fees won't be included. The retailer won't have a Canadian distribution site so expect shipping to take longer as well. That said, there are some products you just have to have and the extra cost is worth it. Serena & Lily - the counter height stools I bought from this site are easily my favourite purchase ever for our cottage. I first tried to purchase some inexpensive knock-offs from Amazon but they were defective and felt cheap. So, I knew I had to go for the real thing. I was able to save a few dollars by waiting for the stools to go on sale and then used my US $ Paypal account to pay for the purchase (so no loss due to the exchange rate). Rugs USA - they offer a huge array of affordable and stylish rugs. I've ordered three rugs in sizes from 5x7 to 8x10 and have paid duties ranging from $30-$65 per rug. Not bad considering they have frequent sales so you can usually get the rug you want at a discount! You would think not having a ship to Canada option would be a deterrent but it doesn't have to be! There are many means available to Canadians to get that product across the border. Get the product shipped to a friend who lives in the US. Have them mail it to you, or bring it to you next time they fly or drive across the border. Get a US shipping address near the border. Get the product shipped to this US address. Drive across the border, pick up your item, drive back across the border, and pay your duties/taxes at Customs. Some companies that provide this service: Borderlinx, ReShip, MyUS, NeedaUSaddress. I haven't personally tried these companies so check for reviews. Use a US package forwarder. Similar to #2, these forwarding companies provide you as US address. Once your package arrives though, they forward it on and can pre-pay duties for you and get it through Customs. The package is then shipped to a either a Canadian warehouse address for pick-up or mailed directly to your house. I recently just used crossborderpickups.ca for this service and it was great! I had two light fixtures delivered to their US address and then forwarded on to their nearby Mississauga location where I picked up the lights in person. Duties were $49 for the two lights, shipping from the Niagara Falls, NY location to Mississauga, ON was $9 and since the site I ordered the lights from (Bellacor.com) had free shipping within the US, that cost was free. In my opinion, using a package forwarder is the best option: you don't pay brokerage fees, duties are known before the product is shipped across the border, you can consolidate packages to save even more, and you don't have to waste time or gas money to drive across the border. Getting your product not enough? You actually want to save money while shopping? Here's some random and useful ways to do just that. Use Google Image search to find a product on other sites so you can price compare. How to do that? Save the product image, go to https://images.google.ca/ and click on the camera icon to bring up the "search by image", click on "upload an image", select your saved file. Google will find similar images and with some digging, you might find the product offered at better prices. I did that when I was looking at this rug which I ended up finding on this site, this site and this site as well. In this case, while all the prices are virtually the same, buying from the Wayfair.ca would be the best choice as its price includes duties whereas the other sites do not. There are also sites like mysimon.com or bizrate.com that price compare but I find the image search is much more accurate and gives clearer results. Leave the item in your shopping cart for a few days. Some online retailers dislike it when you abandon your virtual shopping cart and after a day or two, will send you a coupon code for additional discounts to entice you to follow through with your purchase. This only works if you have set up an account with the retail site and are logged in when you leave your cart. Does it sound like I have a shopping addiction? I really don't! I browse more than I buy, but when I do buy, I like shopping reputable sites with no surprises. Do you have any tried & true online shopping tips? Or any favourite shopping sites? I'd love to hear them.